Aikido founder Ueshiba Morihei (1883-1969) was one of the best students of Takeda Sokaku. Sokaku had a major effect on Ueshiba, and clearly the origins of aikido lie in Daito-ryu. Morihei met Sokaku for the first time in 1915 in the town of Engaru in Hokkaido. He was amazed at Sokaku's martial skills and immediately became his student. He studied Daito-ryu assiduously for about five years, and was so enthusiastic that he invited Sokaku to relocate to the village of Shirataki where he was living at that time along with a group of settlers from Tanabe city in Wakayama prefecture. Sokaku agreed and lived and taught Daito-ryu in Morihei's house for a period of time. In late 1919, Morihei suddenly departed Shirataki upon receiving news that his father had become ill, and he left his house along with all its furnishings to Sokaku. The association between Morihei and Sokaku was renewed in 1922 when Sokaku spent about six months together with his entire family at Morihei's home in Ayabe. By that time Morihei had joined a community of believers in the Omoto religion and, with the encouragement of the religion's co-founder Deguchi Onisaburo, had set up a dojo in his home where he was teaching Daito-ryu. 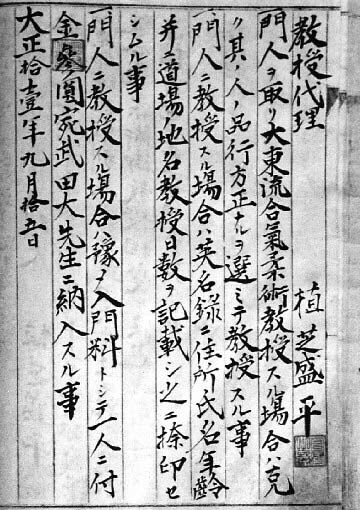 At the end of his stay in Ayabe, Sokaku awarded Morihei the Representative Instructor (kyoju dairi) certificate, which entitled him to teach Daito-ryu on Sokaku's behalf. Subsequently, Morihei received the kaishaku sodensho, the highest Daito-ryu certificate at the time. Although the relationship between the two ceased to be as close as before, they would meet again on several occasions during the next decade. Overall, historical records show that Ueshiba Morihei practiced Daito-ryu for some twenty years. He gradually changed Daito-ryu techniques, eventually formulating his own system, which is now known as aikido.